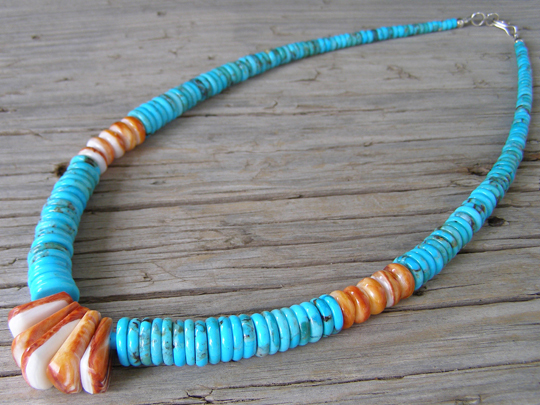 These are hand-turned rolled beads (rounded edges) of stabilized Kingman turquoise and orange spiny oyster strung on beadalon (nylon-sleeved braided stainless steel wire). Five thick graduated tabs of orange spiny oyster "corn" highlight the center of the strand. This is a perfectly graduated, smooth strand of masterfully made beads in a gorgeous shade of blue which is mottled by matrix.